Melani McAlister, a member of the Faculty Senate, was one of the few senators to question Board of Trustees members about proposed changes to the faculty code Friday. Trustees reassured concerned professors at a meeting Friday that they wouldn’t sidestep the Faculty Senate before overhauling the University’s governance policies. 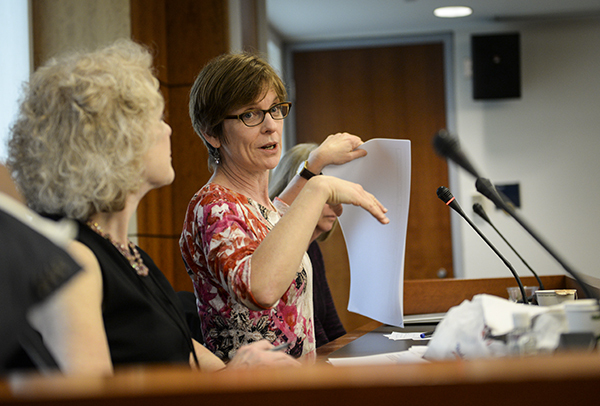 In what was largely anticipated to be one of this year’s most contentious Faculty Senate meetings, trustees looked to ease tensions over how changes to GW’s faculty code would be approved. They said they will wait to finalize the changes until the Faculty Senate passes a resolution — a comforting move after faculty voiced concerns about their involvement. Still, the working groups – made up of professors, administrators and trustees – did not accept many recommendations that the Faculty Senate committees made. The working groups did incorporate a recommendation from Faculty Senate leaders to set a minimum number of full-time faculty that would need to serve on a dean search committee, for example. Other recommendations, like ones requiring Faculty Senate members to have worked at GW for a minimum of six years or limiting the number of voting trustees on dean search committees, were not included in the working groups’ final proposals. Faculty members’ few questions marked a quick change in reaction following two weeks of contentious town hall meetings. The working groups shared their proposals and fielded questions from faculty at the meetings, which took place about a month after the proposals were first released. Melani McAlister, the chair of the American studies department and a Faculty Senate member, was one of a handful of senators to comment on the presentation, and noted that senate committees and working groups have been very involved in the process. She said that like the working groups, senate committees held long meetings to discuss the proposed changes. She added that the senate committees haven’t just responded to the working groups, but have put forth their own ideas. Faculty had said their role in the final revisions process wasn’t clearly outlined, and they were primarily concerned that the process and revisions could limit their role in the University’s shared governance procedures. “Sometimes I feel like they have yet to acknowledge that there are these parallel recommendations from standing senate committees,” she said in an interview. Board of Trustees Chair Nelson Carbonell and the chair of the board’s academic affairs committee, Madeleine Jacobs, both spoke at the meeting, which other trustees and working group members attended. Jacobs, who has also chaired the Board’s subcommittee on faculty governance this year, reviewed the working groups’ proposals over the past seven months. While the groups received feedback on their proposed changes from Faculty Senate committees, she said they stuck with their original recommendations to revisions of topics that included tenure approval, dean searches and review, participation in governance, and school rules and procedures. Carbonell first introduced the code overhaul nearly two years ago, after trustees approved the strategic plan, and the issue has been a point of contention between faculty and the Board over the last two years. The working groups were formed in the fall and reviewed the University’s current policies for the area each was assigned. In January, they sent their recommendations to the Faculty Senate committees for review. The working groups then considered those proposals and reviewed their own recommendations before sending the proposals to all faculty members through the executive committee. The senate could still pass a resolution that the board could change before approving. Carbonell said the trustees made minor changes to the wording of the academic freedom resolution that was passed last spring with approval from members of the senate’s executive committee. Pointing to past precedents, professor of civil engineering Kim Roddis, who is also a member of the Faculty Senate, said that because the change to the academic freedom section of the code was in the wording, it didn’t have an impact on the resolution’s meaning. “I didn’t want people misinterpreting a technicality as bad faith,” she said. But Carbonell and Jacobs eased those concerns during their presentation, he said. “Their remarks indicated that the Board of Trustees will engage the Faculty Senate in further discussions if the Board does not fully agree with governance changes that the Senate may approve at its May meeting,” he said. Charles Garris, chair of the Senate’s executive committee, said in his remarks that faculty could judge for themselves how close the senate and working groups had come to achieving the goals of the revision based on the presentation. He said committees are currently working on resolutions to introduce at the Faculty Senate’s May meeting, which will be the first meeting of the new senate. Those resolutions would be discussed and voted on by the senate to send to the administration and trustees then, he said. “Thanks in large part to the strong outpouring of concern from the faculty though all of the venues, I believe the board realizes the deficiencies of the working group recommendations, and will be responsive to our proposals,” Garris said. This article appeared in the April 13, 2015 issue of the Hatchet.